UPDATE 2012: The residential part of the plan has (as of July 2012) been abandoned. The plan wll now NOT affect the Psycho House, Wisteria Lane / Colonial Street. More Information. 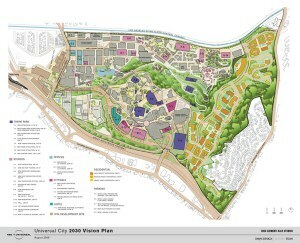 The new Universal City Vision plan was revealed to the public and press on December 6th 2006. It's a bold rethinking of the studio, the theme park, CityWalk, and a new residential area. The plan is in very early stages, with full implementation not due until 2030. It therefore follows that everything mentioned on this page is likely to change. It's possible the whole plan may not get through these early stages. If it does, it will reaffirm Universal's committment to Los Angeles, ensuring the rumours that investment in the park and the studio is dropping never resurface. Below right is a map showing the plan as it stood in August 2006. NB: This plan was drawn up in 2006 and since the announcement of The Wizarding World of Harry Potter coming to Universal Studios Hollywood, much of the plans for the Upper Lot of the theme park have changed. New Rome sets adjacent to Six Points. UNIVERSAL CITY, California, October 1, 2009 — NBC Universal today reaffirmed its commitment to the entertainment industry in Los Angeles and released new details on its plan for its 391-acre Universal City property, home to Universal Studios, NBC, Universal Studios Hollywood theme park, and Universal CityWalk. 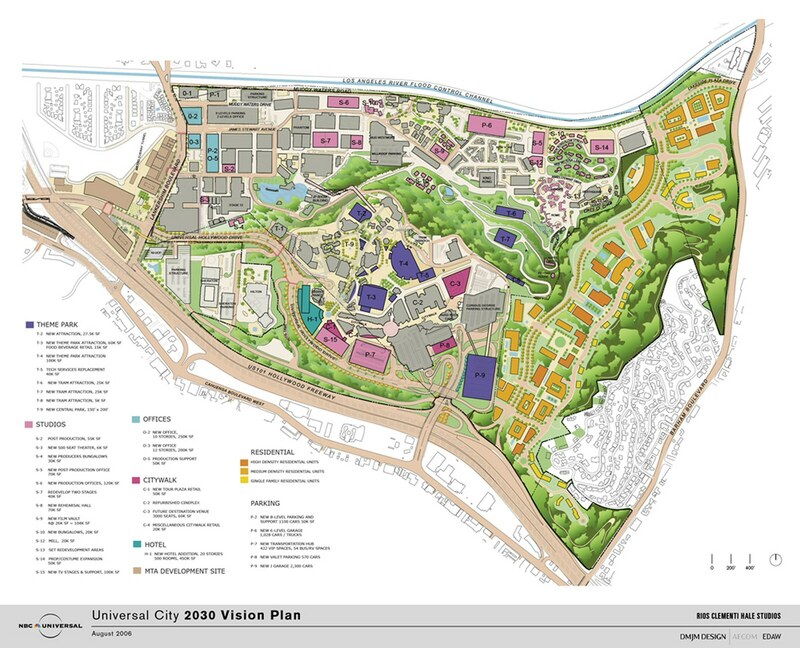 The NBC Universal Evolution Plan, formerly known as the Vision Plan, represents a $3 billion long-term investment to upgrade and improve NBC Universal’s studio production and post production facilities, add new media-related office space, enhance CityWalk and Universal Studios Hollywood theme park and create a new residential neighborhood with 35 acres of open space. The Evolution Plan also includes a $100 million transit and transportation package that is designed to improve mobility in the region and is the largest private sector investment in transportation in the San Fernando Valley in the last 25 years. The Plan is a significant commitment to Los Angeles and the entertainment industry and will create 31,000 jobs during the construction period and 12,000 new, ongoing full and part-time jobs from operations. Once completed, the Plan will generate $26 million in new revenues every year to the City and County of Los Angeles and more than $2 billion in new economic activity annually throughout the County. The original Vision Plan was announced in late 2006 and was designed as a long-range blueprint for the Universal City property. Since then NBC Universal has been working with stakeholders, community leaders, businesses, as well as government agencies including the City, County, Caltrans and the Los Angeles Department of Transportation (LADOT) to refine the original Vision Plan for Universal City to better meet the long-term needs of Los Angeles while fulfilling NBC Universal’s business needs. Key refinements include revisions to the land use plans for the studio and production areas, evolving the masterplan for the residential neighborhood and increasing and detailing local and regional transportation, transit and freeway improvements. “We believe the Evolution Plan is an important step forward on how we will meet the challenges ahead for our industries by creating and securing important entertainment jobs, bringing much needed housing that is connected to transit and by investing in significant local, regional, transit and freeway improvements for the Valley,” said Tom Smith, senior vice president, West Coast Real Estate, NBC Universal. Key future elements include 308,000 net new square feet of production facilities which encompass both new and relocated outdoor sets, soundstages, producer bungalows, screening theater, rehearsal hall, and a film vault; 437,000 net new square feet of production support space and post production facilities as well as 495,000 net new square feet of modern offices, including a new Child Care Center and improved parking and traffic circulation. Key elements in the future include 146,000 net new square feet of attractions at Universal Studios Hollywood, 39,000 net new square feet of retail, dining and entertainment venues at theme park and CityWalk, the option to replace the amphitheater with a smaller venue and a new 500-room hotel at CityWalk. The Evolution Plan proposes to transform a portion of Universal’s studio property into a new and unique neighborhood community with 35 acres of open space comprised of parks and trails. The community is a hillside neighborhood offering a variety of housing options including apartments, townhomes and luxury condominiums all within a walkable community tied to nature, hiking trails, parks, restaurants and local shops all connected to transit, allowing residents the ability to live, work and play without a car. This combination of attributes is not found in any community in Los Angeles today and could become a model for a new way to live in the City. In addition, the community is designed with an alternative road to Barham Boulevard through the community from Forest Lawn Drive to Buddy Holly Drive allowing for easy access to the 134 Freeway (via Forest Lawn Drive) and the 101 Freeway (via Buddy Holly Drive). The residential community is also part of a pilot program by the U.S. Green Building Council and its Leadership in Energy and Environmental Design for Neighborhood Development called LEED-ND, which will include environmentally sustainable design and building practices. Key future elements include 2,900 units at a variety of price points from apartments to stacked lofts to condominiums planned across 124 acres with 35 acres of open space including parks and trails. The height limitations included within the plan are designed to respond to the hillside topography and protect view corridors of the adjacent neighborhoods. It is anticipated that the majority of the residential buildings will range from 4 to 7 stories with limited number of height exceptions permitting taller buildings up to 19 stories in areas designed to avoid view impacts to the surrounding hillsides. The residential neighborhood will also benefit from 180,000 sq. ft of community serving retail including local restaurants, shops, market, cafes and other neighborhood-serving businesses. In addition, the community will have a program of shuttles for the residents connecting to the adjacent Metro Red Line station on Lankershim Boulevard, the surrounding studios in Burbank and the Metro Rail stations in Glendale and Hollywood. This will enable residents to travel to and from work without using a car. “The NBC Universal Evolution Plan has the potential to change the way we live and commute in Los Angeles. By creating a sustainable community connected to transit in the heart of established business districts, there is an exciting new alternative that does not exist in Los Angeles County today,” said Bob Hale, master plan architect for the Evolution Plan and principal of Rios Clementi Hale Studios. Working with Caltrans, MTA, LADOT and the County of Los Angeles Department of Public Works, a critical component of the Evolution Plan is a comprehensive transportation plan that includes local, regional and transit improvements focused on connections to the property and increasing mobility. It invests in important intersections, street widenings and other major physical transportation improvements as well as implements an aggressive program aimed at encouraging employees, visitors and residents to use public transit. NBC Universal Evolution Plan is designed to minimize impacts by bringing much needed housing into an existing employment center next to a transit station where we can promote a new way to live, work and travel in Los Angeles. All new office buildings and the new hotel at CityWalk will be designed to be consistent with Leadership in Energy and Environmental Design (LEED) Silver certification and the residential portion of the project is part of the LEEDs Neighborhood Development program. The community will feature high efficiency windows, heating and cooling systems, lighting and appliances, cool roofs and solar water heaters for pools, programmable thermostats and smart electric meters providing real time energy use feedback for residents to control, monitor and reduce energy use. The project will also utilize drought tolerant planting and include the infrastructure to store, deliver and use reclaimed water, high-efficiency irrigation systems, smart irrigation technology and plumbing systems to reduce the water usage from the project. In addition, the project will continue NBC Universal’s long-standing commitment to recycling and will implement new programs for construction debris. Universal City resides in both the City and County of Los Angeles. Therefore, the NBC Universal Evolution Plan will be subject to a comprehensive, environmental public review and hearing process, during which the public will have many opportunities to engage and participate. The project Draft Environmental Impact Report is slated to be released by the City of Los Angeles in winter.